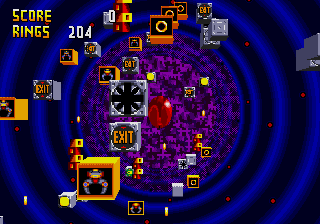 The Bonus Stage for Chaotix can be accessed through giant rings throughout each of the regular levels that appear when the player has 20 rings. 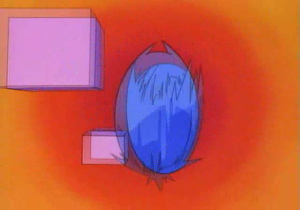 In the Bonus Stage, the character is in a constant free-fall downwards, with various boxes scattered throughout the area. As in the special stage, ring count serves as the timer, with one ring deducted per second. The stage ends when all rings are used up or when the player hits an "EXIT" box. Ring - Keep grabbing these to add seconds to the timer. If you run out of rings, the stage ends. Yellow spring - Player bounces back upwards a short distance. Breaks after 3 hits. Red spring - Player bounces back upwards a long distance. Breaks after 3 hits. In the ending movie for Sonic CD, there is a small segment between 1:03 and 1:05 during the Collision Chaos Zone animation showing Sonic dropping down to hit boxes much in the same way as the bonus stages in Chaotix. This is assumed to be another one of the links between the two games, which were developed by much of the same staff.